The five-centimetre sculpture is an exceedingly rare example of figurative art from the Holy Land during the 9th century BC — a period associated with biblical kings. Exquisitely preserved but for a bit of missing beard, nothing quite like it has been found before. While scholars are certain the stern bearded figure donning a golden crown represents royalty, they are less sure which king it symbolises, or which kingdom he may have ruled. Nineteenth-century archaeologists identified the site, then home to a village called Abil al-Qamh, with the similarly-named city mentioned in the Book of Kings. During the 9th century BC, the ancient town was situated in a liminal zone between three regional powers — the Aramean kingdom based in Damascus to the east, the Phoenician city of Tyre to the west, and the Israelite kingdom, with its capital in Samaria to the south. Ms Yahalom-Mack’s team was digging through the floor of a massive Iron Age structure in the summer of 2017 when a volunteer who arrived for the day struck pay dirt. The layer where the head was found dates to the 9th century BC — the epoch associated with the rival biblical kingdoms of Israel and Judah. In a rare move, archaeologists and curators at the Israel Museum in Jerusalem rushed to put the piece on public display. 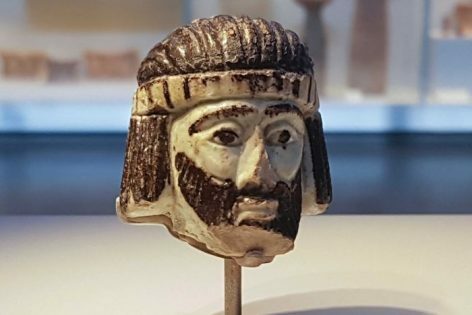 Israel Museum’s curator of Iron Age and Persian archaeology Eran Arie said the discovery was one of a kind. “In the Iron Age, if there’s any figurative art, and there largely isn’t, it’s of very low quality. And this is of exquisite quality,” Mr Arie said. The royal figurine is made of faience, a glass-like material that was popular in jewellery and small human and animal figurines in ancient Egypt and the Near East. “The colour of the face is greenish because of this copper tint that we have in the silicate paste,” Ms Yahalom-Mack said. But a crucial clue for identifying it as a Near Eastern monarch was its “very interesting hairdo”, she said. The bearded figure’s hair is pulled back in thick locks that cover the ears, and is held in place by a striped diadem of gold. Its hairstyle looks similar to the way ancient Egyptians depicted neighbouring Near Eastern people in art. Because carbon-14 dating cannot give a more exact date for the statue’s creation other than sometime in the 9th century, the field of potential candidates is large. Ms Yahalom-Mack posited it could be kings Ben Hadad or Hazael of Damascus, Ahab or Jehu of Israel, or Ithobaal of Tyre, all characters appearing in the biblical narrative. “We’re only guessing here. It’s like a game,” she said.